I recently received Bethany Hamilton’s new book, Body & Soul from Family Christian for a book review. It’s targeted to young girls interested in living a fit and healthy life. It incorporates being spiritual fit with physical fitness. It’s definitely a must-have for teen girls, but I was pleasantly surprised how this book is a great resource for any woman wanting to embark on a healthy living journey. Bethany Hamilton is the original Soul Surfer who lost her arm in a shark attack. It’s a miracle that she survived the attack at all, but she has since recovered and is back surfing, sharing her story and her guide to living healthy. Appropriately, the first chapter is about Confidence. Whether you are a 13-year-old middle schooler or a 36-year-old mother of 2 boys (like me), it’s important to have confidence in yourself. Women of all ages struggle with confidence; Bethany explains that being confident in the person God created you to be is the key to becoming healthy. Being healthy starts from within, and when we love ourselves; we want to take care of ourselves by making healthy choices. This book is actually my favorite fitness related review this year, and I did some fun reviews this year- O2 Fitness and Orangetheory Fitness to name a few. It’s interesting that this fitness review is about a book, yet it’s more than a book- it’s your go-to fitness plan. When you begin a new fitness routine or make a resolution to “be healthy”, you need a plan with detailed instructions. It seems so many of us begin with good intentions to be healthy, go to the gym, exercise, but then something gets in the way- a sick child, a busy time at work, your workout buddy moves. 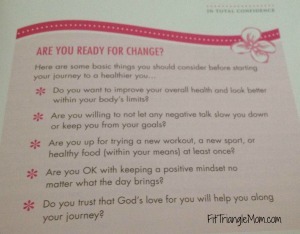 So what do you do when you fall off the healthy lifestyle wagon? Bethany understands when unplanned circumstances arise (i.e. her shark attack), and she encourages you to get back up and begin again. “Humble yourselves before the Lord, and he will lift you up,” James 4:10. You’ll find Bethany’s Soul Secrets throughout the book. Each chapter is a detailed guide in healthy living from Accepting Your Body to Having An Amazing Outlook. There’s a chapter dedicated to eating healthy (it’s not a diet! ), workouts (no gym required), and overcoming challenges for when you hit the wall of discouragement. Once you realize that the book is not a fad diet or the newest exercise craze, Bethany teaches you how to Go the Distance, “For physical training is of some value, but godliness has value for all things, holding promise for both the present life and the life to come,” I Timothy 4:8. I love how she gently shows us the importance of feeding our spiritual side too. 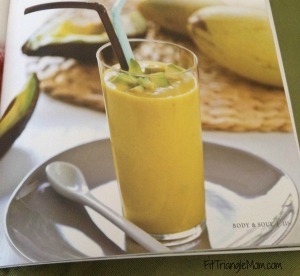 The book also includes a section on Clean Green Recipes, Juices & Smoothies along with bright, colorful photos and descriptions plus a daily meal plan and workout schedule. You can also go beyond the book with the free HarperCollins Unbound App. There are icons throughout the book that can be scanned and will display additional information. I am giving away 1 copy of the Body & Soul book personally signed by Bethany Hamilton. Enter below to enter. You can also purchase the book at Family Christian as a gift or a resource for yourself. 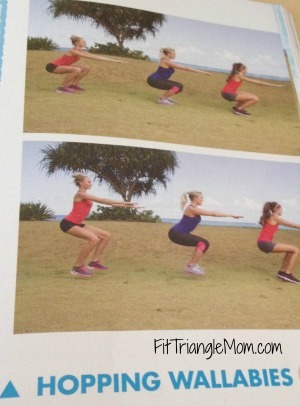 Getting fit is one of my 2015 goals … this book would be a huge help and encouragement! Fitness is a fantastic goal. Thanks for commenting. I love Bethany Hamilton. She is such an amazing example to young Christian women. I’ve frequently thought of spiritual health in relation to physical health… so it would be fascinating to read her take on this. I’ll definitely be adding this to my must read book list. Pinning. (I can’t enter the draw because I’m Canadian). Jennifer, Thanks for commenting. I just checked with the sponsor, Family Christian, and residents of Canada are welcome to enter. I need to change my giveaway tool. Merry Christmas! Sounds like a great read. I think many of us need a boost to our confidence once in awhile. This sounds like a great resource for body and mind! Thanks so much for sharing with #SmallVictoriesSundayLinkup! This book is such a helpful resource. Good for my down-days. Thanks for commenting.